Living a Fit and Full Life: DAWGS Offers Footwear for the Whole Family! Always comfortable, always affordable, DAWGS: A foot's best friend! DAWGS offers comfortable, affordable footwear for the whole family. 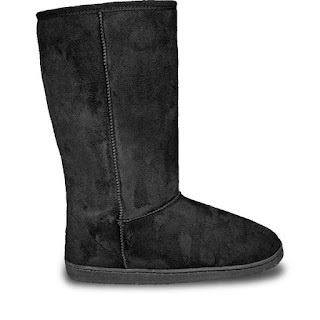 The DAWGS Women's 13" Microfiber boot will keep your feet and legs warm. This boot is built for comfort, padded with a memory foam insole and faux shearling lining. Featuring a durable a slip resistant rubber sole. The round toe and 13 inch taller shaft gives this boot a chic, stylish look. DAWGS Offers Footwear for the Whole Family! DAWGS has a wide selection of both comfortable and affordable footwear that the whole family will love. 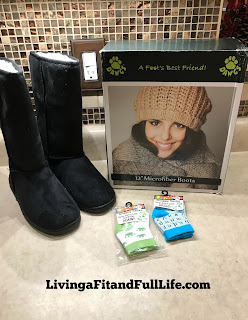 I was sent the Women's 13-inch Microfiber Boots from DAWGS and absolutely love them. Not only do they keep my feet warm and cozy but they look incredible with a cute with a pair of leggings. As soon as I received these boots, the first thing I did was stick my hand inside of them to feel the incredibly soft lining. I've worn these boots so many times because they're amazingly comfortable and often times I leave them on when I get home because I love how they feel on my feet. DAWGS is the perfect place to shop for shoes the whole family will love and I highly recommend them! Click HERE to find a store near you that sells DAWGS! Click HERE to learn more about DAWGS! Follow DAWGS on social media!